Security guards function as a deterrent to trespassers, burglars, and vandals when you have the right people and use them effectively. Using human personnel to watch over your property only makes sense if you have a large area that needs surveillance because of the high cost and maintenance that an employee requires. Guard services are frequently practical for businesses or for properties that have multiple buildings. However, using the wrong people negates any potential advantage having a security guard brings you. Security guards are a human presence that adds a significant complication to the plans of vandals and burglars. Unlike home security equipment that is predictable, security guards can alter their routes and routines to make it more difficult for burglars to predict where they will be at any given time. Security guards in uniform are also frequently mistaken as police officers from a distance, which adds to their ability to act as a deterrent. Guards who are intelligent and well-trained also recognize potential hazards and security risks, allowing you to deal with them before they can be exploited. A good guard reports anything wrong with the property and can fix a lot of simple problems himself while on duty. Security guards also have the ability to arrest anyone who trespasses on your property. They are not police officers, so it qualifies as a private person’s arrest. The person arrested then gets transferred into the custody of the police department. This functions as another deterrent. Guards also help ensure that your security equipment stays in working order. Security system maintenance is part of the guard’s job description to check the status of motion detectors and heat sensors, cameras, window and door sensors, and control panels. The guard then reports anything that isn’t working optimally, so the equipment is fixed quickly. The main disadvantage of using security guards is cost. You either have to pay your security guards personally or you hire a security company. That company then pays the guard a percentage of what you pay it. The other disadvantage is supervision. Security companies have contractual obligations to various clients to provide a certain number of officers to a given post. If the company cannot supply the contracted number of guards, it is in breach of contract. The security business has a notoriously high turnover, so security companies have to hire new people frequently. As a result, the companies often have a higher demand for guards than they have a supply to meet it. This results in people being hired who aren’t properly qualified to perform those job duties. The severity of this problem varies state to state and company to company. Some states require guards to be licensed and to go through a training program while other states don’t. Because of this issue, you have to ensure you are getting guards who are responsible and capable of performing the work you need them to do. This is especially problematic on graveyard shifts, where guards are more likely to fall asleep, disappear, or show up late when they’re not supervised. Verify that your guards are properly licensed for security work if you live in a state where licensing is available. If you want your guards armed, that requires additional licensing. Look for guards that have previous security or law enforcement experience. Hiring former police officers will cost you more money, but your people will be experienced. Consider placing electronic sensors around your property that your guards check using an electronic wand. The wand keeps track of when each sensor is hit, and this allows you to keep track of your guard’s movements if you aren’t sure that he’s patrolling the property effectively. The materials and software to do this add to your cost, but it can provide additional peace of mind. Research any security companies you’re thinking of hiring. Talk to other clients that have worked with that company in the past and find out how satisfied they were with the company’s performance. Sign a short-term agreement with a security company if possible to give yourself a trial run before you commit to anything long-term. Read every line of any security contract before signing it, and make sure you know how to get out of it if you are not happy with the services provided. Security guards are a resource. Only you can decide if they are a resource that benefits you in a way where the rewards outweigh the costs. 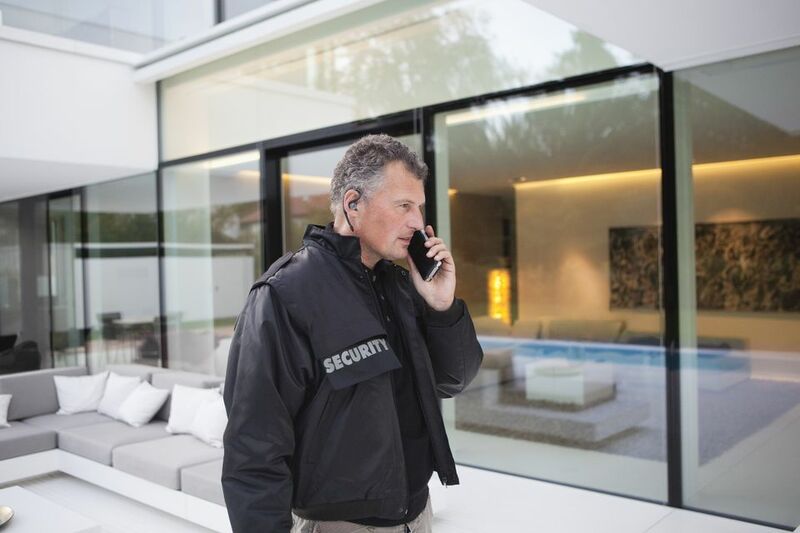 While more typically used for businesses, security guards are frequently present on expensive properties with large houses that are more likely to attract unwanted visitors. The key is hiring the right people. Through research and a little trial and error, you can find a team worth investing in that helps ensure your home or business remains secure.